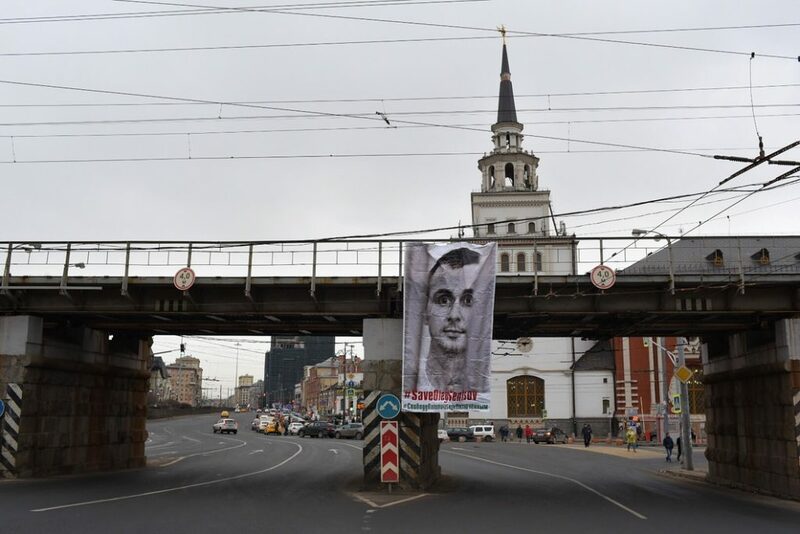 Three-meter banner with the image of a political prisoner, Ukrainian filmmaker Oleg Sentsov, was placed on the road near the Kazan station in Moscow, according to newsaper Novaya Gazeta. “We do this primarily to remind people about Oleg Sentsov and the need for exchange of prisoners. We do this to remind people that there are political prisoners in our country,” one of the activists told reporters. The publication also noted that a series of one-person pickets in support of Sentsov at the Reception Office of the President of Russia continues for about 200 days. Earlier, QHA media reported that activist Vladimir Yegorov raised the flag of Ukraine above his house in Toropets, Tver Oblast of Russia in support of Oleg Sentsov. Yegorov demands from the President of the Russian Federation Vladimir Putin to release Sentsov and the Ukrainian sailors who are considered to be prisoners of war. Ukrainian filmmaker, political prisoner Oleg Sentsov is serving a 20-year sentence in the strict regime colony of the city of Labytnangi, Yamalo-Nenets Autonomous District of Russia, on charges of terrorism. He became the first Ukrainian in history who was awarded the Sakharov prize for the Freedom of Thought. Earlier it became known that the winner of the Academy Award in the nomination of the best director, the Mexican Alfonso Cuaron, supported to call for the release of Sentsov.